pack worth $30.00. that consists of the newest Zva CHA release. Now, onto some goodies. 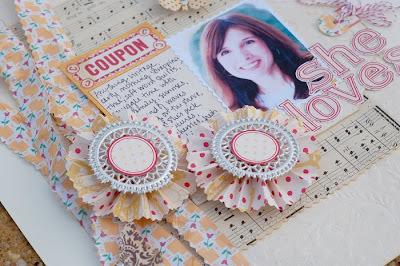 As you know, I'm thrilled to be the guest designer for Jenni Bowlin Mercantile this month. The kits and add ons are just amazing. 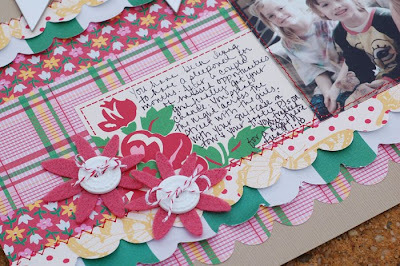 The Papercrafting kit is filled with Jenni's new Homespun line. LOVE it. 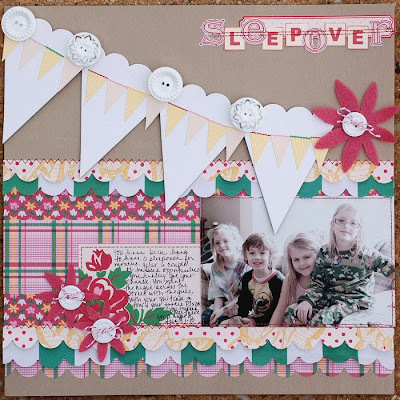 The project kit is adorable and has a fun banner and the new spring mini bingo cards. And the add on kit has the most adorable vintage goodies in it. You already saw my first page in the post a couple down from here. (The Cake layout). Next is a page about me and some of the things I love. 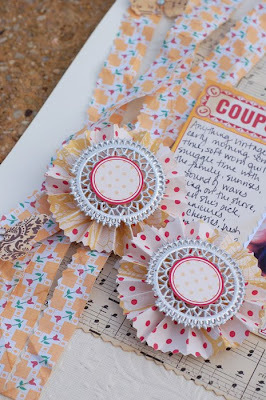 I used the kit exclusive butterfly paper to make some rosettes and tried to keep the page somewhat monochromatic. I love the embossed cardstock! I decided to give this page lots of texture so I crumpled up the strips of paper and attached them with glue dots. I spritzed the butterflies with Lemon Grass Glimmer Mist to have them go along with the 'yellow' theme of my page. I love this next page, mostly because of the feelings behind it. Ryan has been DYING to have a sleepover and a couple of months ago, he finally did. He spent the night with our friends across the street. (They are quadruplet girls - one isn't in the photo- what a fun story to tell when he's older. ;) ) Anyway, he was just thrilled! So, of course, I had to go over in the morning and take some pictures! I cut lots of strips of paper and stitched them to the page. Then, I scrunched them a bit for added texture. 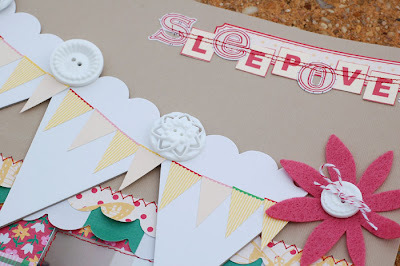 I love the banner chipboard and used it to draw the eye to the photo. I have a couple of more JB projects to post, so check back in a couple of days. the layouts are gorgeous!! and a big congrats on the guest DT. love your work! Im not surprised ;) You did an amazing work with JB!!!! Love the layouts, so detailed so you! Absolutely AMAZING work as always!! Always is an inspiration to view your work!! Wow did you ever rock those products and papers! LOVE that adorable banner on the layout. Wow, what gorgeous layouts, I love the banner, they are definately in at the moment, just divine. What stunning layouts! Truely beautiful! And I won! Thank you so much for letting me know! What a fantastic surprise! These are such GORGEOUS creations! I have been having fun making flowers like this too...just finished something today with them...so much fun! I am SO in love with all your creations Anabelle! You are amazing with Jenni B. I LOVE their stuff and I LOVE how you use it! Congrats Annabelle! 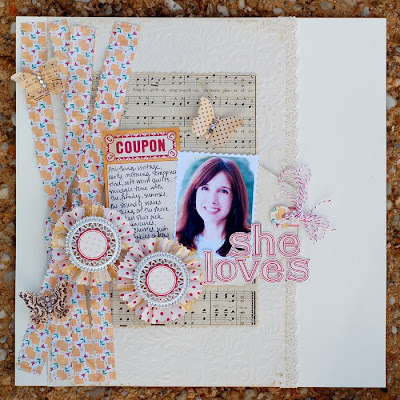 Your Jenni Bowlin layouts and cards are positively stunning!